Work continues at the Village Solars apartment project in Lansing, though it’s mostly been interior construction these past couple months. 102 Village Place has had some of its composite wood siding applied (LP SmartSide treated and engineered wood siding), and the electrical wiring and air-source heat pump units are in place, though not fully connected just yet. 102 VP was already framed, roofed and fitted by the November visit, so chances are, they’ve already done utilities rough-ins and insulation, and they’ve moved on to drywall, baseboards and interior trim boards, priming and painting, and maybe some plumbing fixture and cabinetry installs. The three-story apartment building, which replaces a ten-unit 1970s structure, will have 24 units – 12 studios, three 1-bedroom, six 2-bedroom, and three 3-bedroom. If one wants to look at this from a population perspective, each of the ten units was a 1-bedroom, so the back of the envelope says there will be a net gain of 26 residents (one per bedroom, 36 – 10). And presumably, a couple million dollars in assessed value. 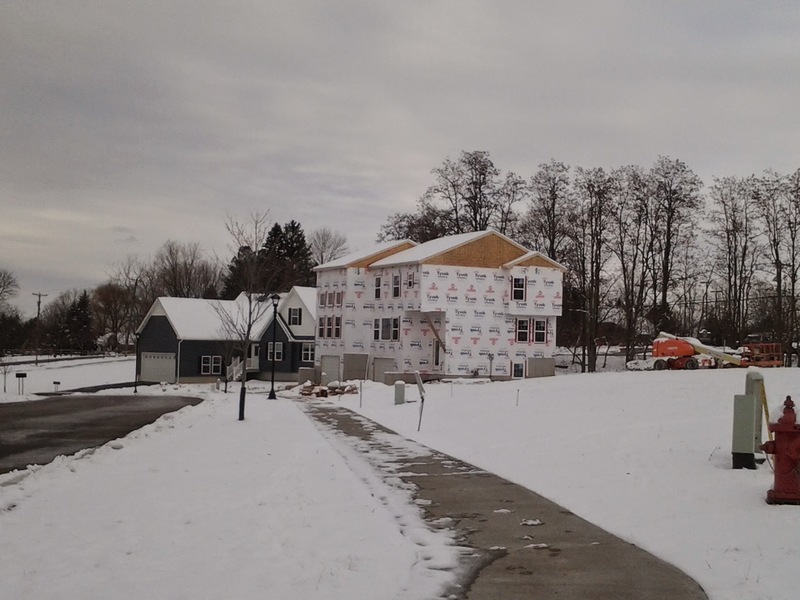 116 Village Place, the younger of the pair, is not as far along but has been fully framed, wrapped and shingled since November, and some siding has been attached. It looks like not all the windows have been fitted, given the wrapped rough opening on the third floor in the first photo below. Based off the open door in that same photo, it looks like framing, insulation and utilities rough-ins (plumbing, electrical, HVAC) are ongoing. 116 is the smaller building of the two, with 18 units, 12 studios and six 2-bedrooms. Like 102, it also replaces an older apartment building, an eight-unit structure of one-bedroom units (and 14 more residents on-site, using the same math as before). Lifestyle Properties is the developer, with their in-house contractor in charge of construction. It doesn’t look like the new units are being marketed yet, but existing 2-bedrooms are going for $1,325/month, and 3-bedrooms for $1,375-$1,720/month. Anecdotally, Lifestyle has had an easier time filling the smaller units than the larger 3-bedroom units.